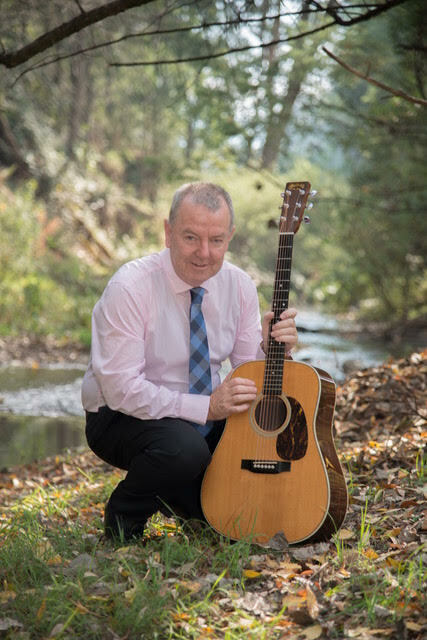 I began playing music in 1974 as a teenager,growing up in the northern suburbs of Melbourne. My first foray into music was hard rock, the music of Jimmy Hendrix, Carlos Santana, Alvin Lee, and anything else above 100 decibels! I also dabbled in fingerstyle and folk guitar, and gained much inspiration from the music and songs of Bob Dylan. Then in about 1976 I chanced upon a recording of jazz great George Barnes and fell in love with jazz guitar, a love that endures to this day. I studied for 5 years at the Bruce Clarke Guitar Workshop in Melbourne where I learnt about not only jazz, but theory, note reading, and technique. Bruce was uncompromising in these areas of music and remains the biggest single influence on my musical career. His knowledge of all things musical, and his often colorful ways of describing them moulded whatever musical abilities I had. Sometime around 1981, at Bruce's suggestion, I came across some recordings of American flatpicker Norman Blake and fell in love with the acoustic dreadnought guitar styles of that country. Along the way I came across the origins of that music, namely Irish, Scottish, and English folk traditions, and started attending some of the Irish music sessions here in Melbourne. In 1983 I was approached by Jamie McKew who was organising some concerts by Irish duo Brendan Mulkere (fiddle), and the gifted John Carty (banjo). He asked me if I “could back these guys up” on guitar. They were joined by our own Joe Fitzgerald, and I must have been the luckiest traditional musician ever because that was the very first Irish band I ever played in. It was hardly surprising that having sat next to and accompanied Carty for that most memorable fortnight that I should purchase a banjo. “The Home Ruler” and “Kitty's Wedding” was the first set I ever learnt and I've been at it ever since. I was introduced to the music of Galway's “Shaskeen” by Billy and Eileen Moran and played with Billy for over two decades at various sessions, dances, and concerts. Once we were playing for a play as part of the Melbourne Fringe Festival and at the rehearsal we got through almost to the end of the play when the writer of the play then said”And so to finish could you play “God Save the Queen”. Whilst Billy sat there speechless, and quivering at the lips, I explained as best I could with my very limited knowledge of Irish history the difficulties two traditional Irish musicians have in playing this piece, and after some discussion we settled on “Advance Australia Fair”, and we all lived happily ever after! In 1993 I was accompanist for East Clare fiddler Martin Hayes, and that was a busy year because I also played a series of concerts with concertina player Catherine Custy. Martin is a most perceptive person, someone who is serious about his music and yet has a lot of fun with it . Catherine was just a bag of laughs interspersed with some gorgeous music and I have fond memories of both tours. During the 1990's I was also involved in assisting two touring cultural groups from Ireland, “Na Ridiri” and “Ceol Chiarrí”. “Na Ridiri” was a selection of 14 of Ireland's very best dancers, singers, and musicians and it was a privilege to be associated with them. “Ceol Chiarrí” were a group of Ireland's most gifted youngsters many of whom won or went on to win All Ireland music and dance titles. Friendships with members of both groups endure to this day, and I always look forward to catching up with them during my regular visits to Ireland. I have released two CDs of traditional Irish music, “The Maid At The Well” and “An Sliabh Glas/The Green Mountain”. Both CDs contain music played on guitar and banjo, and I've also published transcription booklets for both CDs. I've also produced a 168 page “Guitar Chord Dictionary” containing over 2,100 chords. I don't practice guitar enough! I spend most of my time doing "user experience" work. I have a consulting company called Information & Design in Melbourne.